Tomorrow I’ll be presenting at the GAFE Summit in Melbourne. Check out the presentation I’ll be sharing. Google APPS… A whole school approach. Thanks to my deputy Kate Korber for helping me put this together! Before you stop wanting to read this post… I already know what you’re thinking… “As if I have time to read all of these words!” So I’m giving you the heads up. I promise there is a method to my maddness and by the time you’ve finished reading this, you’ll realise you’re not alone and there is a solution to teacher’s biggest problem! I had to explain the entire story. I have been teaching for 5 years now and the thing I struggled with most in the beginning, was keeping up with anecdotal notes and ensuring I knew where all my kids were at. All all I could think about was, “How am I supposed to team teach, plan, track student learning, personalise tasks, set goals with my students, keep parents up to date with what their children are learning about and make sure I keep record of everything… All at the same time? (Not to mention there’s clearly more I could add to the list). These were the biggest challenges for me in my first year as a teacher. To top it off, it was only term three when I was told, “You need to open your doors and team teach…” So not only was I trying to keep track of my own kids, but I was also trying to keep track of the rest of the year level as well. Anecdotal note taking was a major challenge for me and still is for some teachers. As soon as those doors opened, myself and my colleague (Belinda) had anecdotal notes flying everywhere. We couldn’t keep track of who wrote what, when they were written, or what they had even written about. We had no idea which notes belonged to which children and writing notes for groups of children was even harder. I’m a big believer in finding a solution to the problem… So that’s what I did! It took a while, but I got there in the end. After a term of craziness, I knew I couldn’t keep it up. We tried to find ways to fix it. We attempted to use Evernote but it didn’t have the functionalities that we needed, and we also tried Google Docs! Nothing worked. Luckily my husband is a web developer. I explained to him that I needed a secure online platform that would allow me to take anecdotal notes, group children, save notes, date notes, edit notes, create groups, create subjects, create checklists, upload work samples and share notes with colleagues. So that’s what we did. We created just that. My Focusbook is an easy-to-use web based application that allows teachers to create and share notes about their students, their learning needs and their goals. With integration over multiple devices, My Focusbook enables teachers to take notes wherever they are, whenever they like. Since creating My Focusbook, all of the teachers I work with are using the application. Report writing is as simple as copy and pasting. 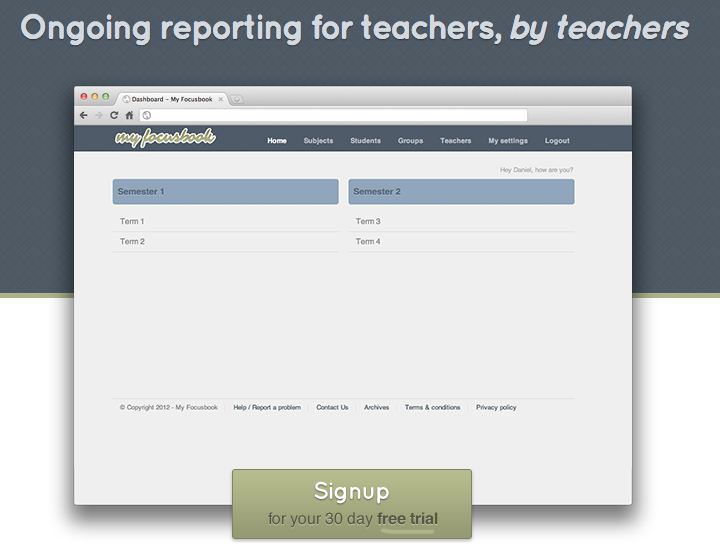 Our reports are personaised and tracking student learning is easier than ever before. We can take notes about any child in the year level we work in. Notes are automatically signed with our name, dated and filed into student folders, terms and subjects. Groups have never been easier to create, track and take notes about. The more time I spend in education, the more I hear about how important it is for teachers, parents and children to be able to collaborate. Let’s face it, education has changed (not enough as I think it should) but enough for parents of children today to have noticed. My Focusbook has allowed me to collaborate with collagues like never before. I can now keep track of learning easily. In the future, students will be able to create their own notes and parents will be able to login and see notes at any time. Reports will be long gone because reporting will be ongoing. I can honestly say My Focusbook allows me to focus on the important stuff… Like teaching. Check out My Focusbook today and get your first term free! We’re thinking about giving schools the opportuinity to use My Focusbook for free for the entire school year in 2015. Let me know what you think. My Focusbook is constantly changing and evolving. We love hearing about what other teachers want and we want to stay true to our word. ‘For Teachers, By Teachers.’ Let me know if you have any suggestions.